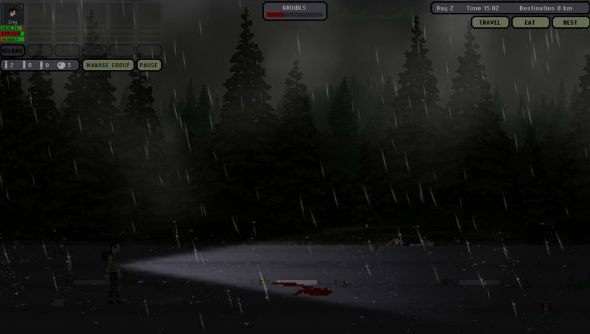 Interesting indie roguelike March of the Living has released on Steam. In the mood for more rotting corpses? I know I am! Here’s our list of best zombie games. I just spent twenty minutes with March of the Living, for science, and it is very much like FTL. It’s a point the developer has been hammering home and it’s easy to see why, as it clearly wears its inspirations on its ripped and bloodied sleeve. It doesn’t feel derivitive, though, as it’s very much its own thing. I began the game as a lone man searching for his family. From a map I had to choose from multiple possible routes and points of interest. Weighing up the risks and rewards, you have to navigate this map, with random encounters and narrative snippets happening along the way. It’s all backed up by real-time combat with the ability to pause, looking at percentages and counting bullets before committing to each shot. It’s lovely stuff and is backed by some atmospheric soundwork and presented in a pleasing retro art style. If that sounds like your sort of thing, March of the Living is $13.49 on Steam now.